(leading to ExpertRating Administrative Assistant Applications Skills Certification). Discover how economics, accounting, business law, organizational behavior, and management affect administrative assistant responsibilities and activities. Determine how economic forecasting and the world economy affect an enterprise; understand the basics of accounting including the general ledger, the accounting equation, key accounting terms, and the types of accounting; and learn how balance sheets, income statements, cash flow management, and financial controls help keep your organization moving in a positive direction. Understand the fundamentals of business law, contracts, and the principal-agency relationship; discover the forms of business organization and learn about ethics and organizational politics; and understand the basics of international business. Find out how you can successfully plan and exercise control, discover how problem solving and decision making can increase your efficiency and effectiveness, and explore various organizing principles. See the difference between motivation and leadership, discover how to increase creativity, find out how marketing differs from sales, and learn of the finer points of operations management. Understand why effective change management is so vital, and determine how to recruit, evaluate, select, and train team members. This course may help you prepare for the internationally-recognized Certified Professional Secretary® (CPS®) and the Certified Administrative Professional® (CAP®) exam offered by the International Association of Administrative Professionals® (IAAP®). This course includes knowledgeable and caring instructors who will guide you through your lessons, facilitate discussions, and answer your questions. The instructors for this course will be Becky and Tony Swaim. About the ExpertRating Online Administrative Assistant Applications Course instructor : Becky and Tony Swaim have helped thousands of clients, colleagues, and students reach organizational and personal goals. Working in the medical, manufacturing and education fields, the Swaims manage a successful consulting firm in southern California. Starting her career as a medical administrative assistant, Becky provides assistance as a program manager to various medical practices and has managed a large staff in the medical reimbursement field. Becky earned a Bachelor's of Arts degree in Speech Communication from California State University, Long Beach. Tony Swaim has been an accomplished online instructor since 1998. His industry experience includes twenty years of medical device manufacturing management. Tony's consulting areas are project management, customer service, total quality and supply chain management. He earned an MBA from California State University, Long Beach and holds professional certifications in five disciplines. Administrative Assistant Applications requirements: For taking this instructor led Online Administrative Assistant Applications Course you need Completion of Becky and Tony Swaim's Administrative Assistant Fundamentals course (or equivalent experience). Internet access, e-mail, and the Microsoft Internet Explorer or Mozilla Firefox Web browser. "I enjoyed the course, learned a lot, and felt it was presented well." "This is the second course I have taken with Becky and Tony Swaim. I was well pleased with both the course material and the instructors. I definitely learned a lot from both. I will look for more courses taught by Becky and Tony and will never again be reluctant to take an online course. Thank you for providing these courses." "Thanks for another wonderful course! I really enjoyed it. Keep up the good work." "I have thoroughly enjoyed this class, it was a little tough, but I made it. I look forward to doing more classes with ed2go. Thank you." "I found that I could take any subject from the lessons and apply it to my tasks at work or knew of a situation where the subject applied; it was fascinating to look at things in a new way and understand why managers/supervisors operate the way they do." "Thank you very much for all your hard work in developing this coursework. It is a great volume of information and reference material. I will definitely be using it in the future. I look forward to really having the opportunity to study through all of the supplement website listings. I've enjoyed your "class" and have gleaned many new facts and useable tidbits." "This was a very informative and useful course for any person who owns a business or works in a business environment." "This course gave me insight to the business world. Thank you for presenting the material in such an enjoyable and easy to understand format." "I felt the course had many avenues of information and gave me a well rounded experience and will be very useful." "I really enjoyed learning about a new career with you. I found that your two courses were very challenging for me. I'm looking forward to taking more courses from you." "I found the class to be very informative and helped me to see a lot of things in my day to day work in a new light. I believe this class will not only help me to understand my office better but also help me in my goal to seek out new adventures in a different job." "I feel that he course and instructors were completely in line with my expectations and were very "user friendly" in each section of this course!" "I really enjoyed this course, actually the series of courses and feel as though I can use this information on the job. Thanks so much." ExpertRating is one of the world's only ISO 9001:2015 Certified companies (from TUV America) offering an Online Administrative Assistant Applications Course (leading to ExpertRating Administrative Assistant Applications Skills Certification). When you choose the ExpertRating Online Administrative Assistant Applications Course you can be sure that you are buying a premium International certification that is recognized by hundreds of employers and Government bodies in the US and other countries. With ExpertRating you get certified quickly online and you are equipped with a store house of information through the in-depth Online Administrative Assistant Applications Courseware which has been developed by experienced Business Administrators. 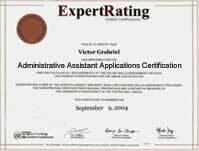 The ExpertRating Administrative Assistant Applications Skills Certification is by far the best value for money instructor led Administrative Assistant Applications Program at $129.99. How much does the Administrative Assistant Applications Certification cost and what does it include? You can buy this Online Administrative Assistant Applications Course leading to Administrative Assistant Applications Skills certification at a special offer price of only $129.99 which includes the in-depth Online Administrative Assistant Applications Courseware and exam fee. This is the best value for money Administrative Assistant Applications Program available till date. You get the following services within the USD $129.99 fee. In-depth Online Administrative Assistant Applications Courseware including scenarios and case studies. World wide airmail delivery of the hard copy Administrative Assistant Applications Certificate. The Administrative Assistant Applications certificate can be used to prove your certified status and does not mention the words "online". The process of getting yourself certified is very simple. 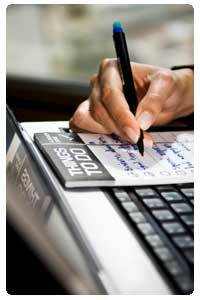 All you have to do is buy the ExpertRating Online Administrative Assistant Applications Course for $129.99. Log in to the instructor led course using your password. Go through the Online Administrative Assistant Applications Courseware (which would take you 6 weeks) and complete the final Administrative Assistant Applications certification exam at your convenience. 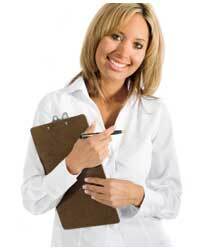 You can complete the exam within 2 months of buying the Administrative Assistant Applications certification. The result of the exam appears as soon as it is completed, and your Administrative Assistant Applications certificate is mailed immediately. Chapter assignments to help you practically use the Administrative Assistant Applications skills that you will learn during the Administrative Assistant Applications Course. The final exam is fully based upon the Online Administrative Assistant Applications Courseware that is provided along with the Administrative Assistant Applications certification. If you have gone through the courseware properly you should not have a problem clearing the exam. The exam consists of multiple choice questions from all chapters of the Online Administrative Assistant Applications Courseware. The profession of Administrative Assistants is ranked among the largest professions in the United States! With the careers in Administrative Assistant Management booming, this is the time to become a certified Administrative Assistant! According to the According to the Bureau of Labor Statistics, U.S. Department of Labor , Occupational Outlook Handbook Statistics, there will be 4,603,000 job opportunities for the Administrative Assistants and Secretaries by the year 2016. This profession has a great future and offers the largest number of new jobs. 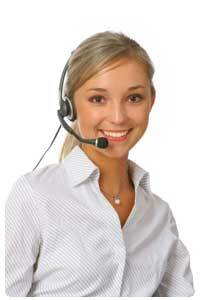 Administrative Assistants now perform less of clerical works and are more of communication and information managers. They secure, revive and collect information and disperse it to the staff and the clients. They can literally be termed as organizational managers who fix appointments, preserve paper work and do other managerial activities. Since many organizations are going global, you can increase your value by knowing what's taking place in the world economy. In our opening lesson, we'll define the phrase "world economy" and then present the concepts of business cycles and economic growth. You'll learn the differences between gross domestic product (GDP) and gross national product (GNP) and macro and microeconomics. At the end of the lesson, you'll discover the importance of economies of scale and the experience curve, and you'll see how econometric forecasting helps you determine the future. In this lesson and the one that follows, we'll emphasize accounting and financial concepts and fundamentals to help you increase your readiness to use financial information. You'll gain a strong foundation by learning about the general ledger, by seeing the difference between accounting and bookkeeping, and by investigating the different types of accounting. We'll demystify debits and credits and present the accounting equation as a cornerstone of all modern accounting systems. Now that you've absorbed the basics of accounting, it's time to learn how to apply financial information. We'll start off by reviewing two vital financial statements that you will find at nearly every organization—the balance sheet and the income statement. Next, you'll find out how to account for inventories and then discover the significance of cash flow. By the end of the lesson, you'll clearly understand how sound cash management helps companies stay on the right path. Administrative assistants need to know the basics of business law. While we don't expect any of you to become lawyers, we do want to make sure you have a good grasp of key legal concepts, such as the principal-agency relationship and the basics of contracts. We'll start things off by looking at the idea of law, going through an overview of the legal system, and discussing the essence of commercial law. We'll tackle the essentials of contracts, such as the elements and the various types, and finish up by discussing Article 2 of the Uniform Commercial Code. In today's lesson, we'll examine the four most popular organizational forms: sole proprietorship, general partnership, limited partnership, and corporation. You'll learn all about organizational politics, and see that wherever people work together, you'll find politics. We'll also touch on business ethics, a critical concept that has received much attention in recent years. Firms are pursuing international business at rapid rates. After you complete today's lesson, you'll know where to look to help your company meet their international business objectives. We'll explore the origins, characteristics, and definition of international business. You'll learn of the various ways to get started with international operations, including exporting and joint ventures. We'll conclude by exploring how international business varies by key area, including economic, political, legal, culture, technology, and demographic considerations. Life is filled with opportunities, problems, and choices. When you effectively plan and control your activities, and also make timely decisions and solve problems, you become a valued asset. We'll look at the ins and outs of planning because just about everything you do begins with a plan. We'll help you learn about the counterpart of planning: control. By the time you finish Lesson 7, you'll know all about problem solving and be able to apply a model of decision making. Organizing is a critical topic that many companies struggle with. In this lesson, you'll discover how resources are organized so employees can productively perform job duties and complete tasks. We'll begin by studying the purpose of organization and examining several coordinating principles, including authority, power, and span of control. You'll learn the purpose of the staffing function and how to evaluate such key elements as recruitment, selection, appraisal, and development. We'll conclude this lesson by looking at six different forms of organizational charts. It's often said that motivation and leadership are two sides of the same coin. It's difficult to have one and not the other. Today, we'll begin by defining motivation and exploring four theories of motivation, and then we'll move into leadership. You'll learn about the different types of leadership and discover the difference between delegation and empowerment. We'll also examine creativity and help you see how you can increase your creativity levels. We find that most people believe marketing is either advertising or selling. Our primary objective in today's lesson is to make sure that you clearly understand the distinction between marketing, advertising, and sales. You'll discover what it means to be consumer oriented. Also, you'll learn how to apply the four Ps (product, place, price, promotion) and see how these variables work together to form marketing strategies. Operations management is one of the unheralded activities at a company. The folks that work in this area don't receive much credit and don't lead a glamorous life. They're the behind-the-scenes people that keep the ball rolling so that customers are happy and the company makes profits. Today, we'll explore the diverse nature of operations management and see how selecting, designing, operating, controlling, and updating play an important role in all operating systems. We'll explore such key concepts as forecasting, capacity, and make-or-buy analysis, as well as discussing their importance. In our final lesson, we'll discuss why change is so important, review why people are reluctant to change, and explore strategies that can help you overcome resistance to change. We'll help you establish a winning team and lead you through the stages of recruiting, evaluating, and selecting team members. We'll explore the concepts of a core team, extended team, and the overly important team. We'll finish up by discussing the complete performance planning process, including how to address performance problems and how to make reviews more meaningful.